Pro-Catalonia independence supporters have held several rallies to protest against Sunday’s police crackdown. 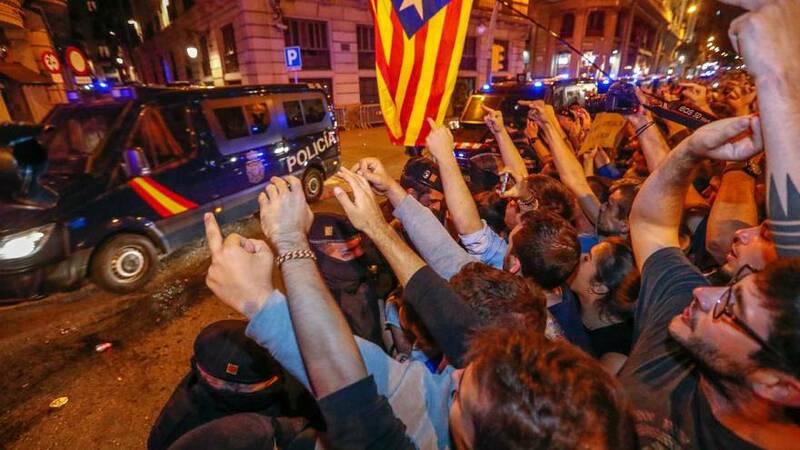 Officers, many of them drafted in from other areas of Spain, had used rubber bullets and batons to try and disrupt the independence referendum. 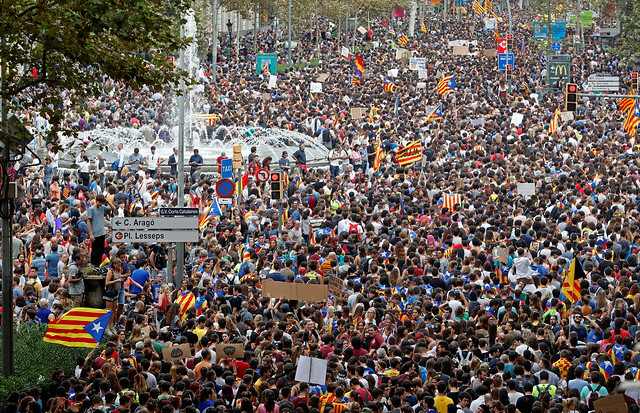 An estimated 900 people were hurt in the process of the vote according to Catalan officials. During Monday’s protest (Oct 2) Catalan police, known as “Mossos d’Esquadra” created a cordon in front of Spanish National Police officers to help manage the demonstration. Catalan police are held in affection by Catalans, especially after they hunted down Islamists accused of staging deadly attacks in the region in August. Results have shown that those who voted had overwhelmingly backed splitting from Spain. Catalonia’s leader has called for national police officers in the region to leave and for Madrid to recognise the referendum result. Spanish Prime Minister Mariano Rajoy has since met national party leaders saying he is committed to seeking a joint response to the “pro-independence” challenge in Catalonia. But time is of the essence for Rajoy. Some separatists in Catalonia’s parliament want to see a unilateral declaration of independence within days. Rajoy does have the constitutional power to sack the assembly but such a move could inflame the crisis. In the meantime there’s to be a general strike in Spain’s wealthiest region ostensibly in protest against the police action, but organised by pro-independence groups. Two of the main unions, the General Union of Workers (UGT) and Workers’ Committees (Comisiones Obreras), have however distanced themselves from the strike saying it will only further polarise the political situation.